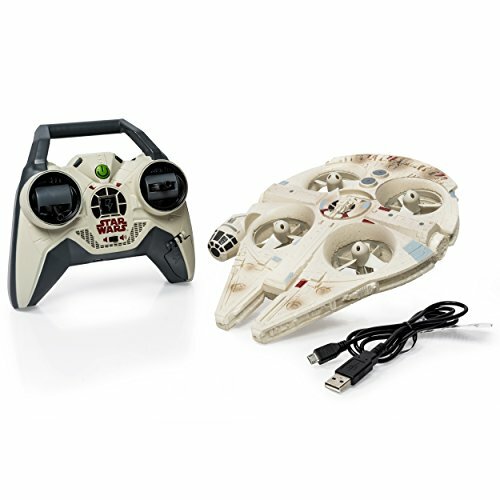 The Millenium Falcon Drone is a real thing you can buy now from Air Hogs. You can fly it indoors and actually get the feeling that you’re at least Han Solo or Chewbacca against the Empire ( which could be replaced by your cat). The body is made of sculpted foam and the propellers are quite inconspicuous so it actually looks like Science Fiction magic when flying. It’s a remote controller quadcopter and the transmitter itself actually comes with sound effects for a more immersive experience. Make sure the drone doesn’t go all the places and can stay relatively stable in the air after you calibrate the gyros. You should look for at least 5 minutes for toy drones of this size! Flight range can be important if you’re flying outside. The price for this drone is acceptable, but definitely more expensive than some cheap begginer drones I would recommend. You’re not getting a camera or any fancy features, however, the experience itself is worth it fi you’re a star wars fan. The drone comes with one blue LED at the back and 2 LED’s in front, so you can easily fly it in darker rooms or even at night. Flying this quadcopter outside is doable, but only in low or no wind conditions. it’s light yet bulky frame will definitely make it wobble in wind and you might lose control. The transmitter for this drone is a little bit more special than what you can find on most toy drones. It comes with a pretty unique charging system that allows you to charge the drone itself from the transmitter though a cable found on the right arm off the controller. The controller itself works with 6 AA batteries and you can actually charge them if they are chargeable with another separate cable that’s included in the package. A pretty fun and unique addition is that it comes with included sound effects, so you might hear Chewbacca screaming from time to time or random laser sound effects. In my opinion it isn’t as great as the controller sound effects from the Propel Star Wars drones, but it’s something that still gets you into that Star Wars mood easily. This drone doesn't have many tricks under its sleeve, but even so, for Star Wars enthusiasts it's quite a catch and something that looks more than magical and makes you feel like you're flying the real deal.